David Auburn knows his way around words, a good story, and onstage action to build an exciting, heart-pounding theatrical experience. 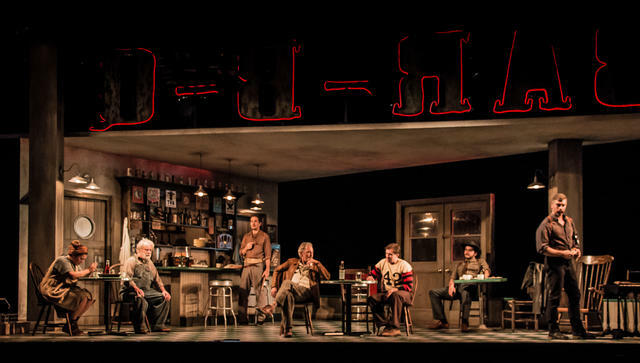 In “The Petrified Forest” at BTG, he masterfully maneuvers a strong 13-member cast through Robert Sherwood’s rich dialog and seething emotions for a contemporary reflection on timeless themes that combine humor, intelligence, desire, and violence. Though the play debuted on Broadway in 1935, there have been many adaptations of the script for film, television, and radio over the years. While not as politically influenced as many of his other works (in addition to winning four Pulitzer Prizes, Sherwood was also a speechwriter for FDR), “Petrified Forest” it is known for its realistic ethos and socio-literary relevance. The story takes place during the Depression as the country seems to slip further into lawlessness, and the legacy of WWI creates situations for characters of different social strata to meet with conflicting values and desires. This creates rich opportunities for conflict and resolution, and Sherwood’s inventiveness as a storyteller has given us some iconic characters and situations. David Adkins as Alan Squier, the intellectual drifter, delivers some of Sherwood’s best lines. Adkins is a smart actor who not only knows how to land the line for the audience, but how to communicate with other actors so that they get their moments too. John Thomas Waite’s Gramp Maple carries much of the humor and projects an energy that is delightfully innocent and pure. In a relatively smaller role, but with great punch, Jennifer Van Dyck as the repressed Mrs. Chisholm shines with a character that is fresh, unexpected, and delightfully funny. 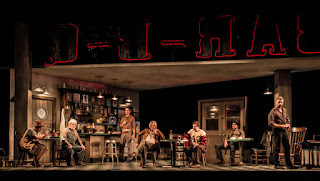 The talented cast in this production work well together and Wilson Chin’s set enhances the poverty of place while Scott Killian’s sound design enhances the bleakness of the environment. There is not one weak member of the cast, though sometimes lines were lost when actors upstage did not project or articulate well enough to be heard clearly. Still, Auburn directs this as an ensemble piece and pays homage to a style of theater that is rare today. Berkshire Theatre Group can be proud to present this play as part of their 90th Anniversary season, and with productions of this caliber, they can look forward to being around for a very long time.